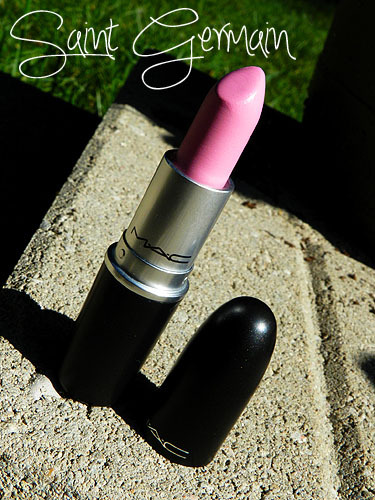 MAC Saint Germain Lipstick Review, Photos and Swatches! 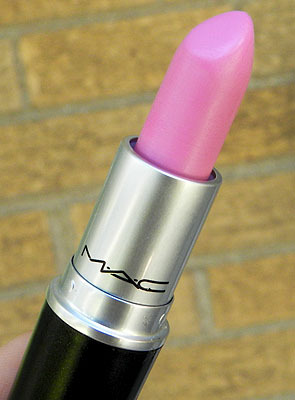 MAC Saint Germain Lipstick ($15) is described on the MAC website as a clean, pastel pink. It’s a very blue-based (cool toned) pink, so it can appear a bit lilac-purple. 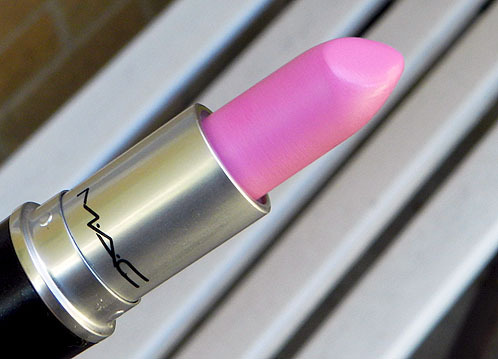 It’s a very “barbie” pink, that can be difficult to pull off, and most times is a hit or miss on most skin tones. I think it’s absolutely beautiful on light skin tones (see Katy Perry below) and I actually didn’t discover my love for blue-pink lipsticks until I tried one minus my faux tan (around the MAC NC15 coloring). 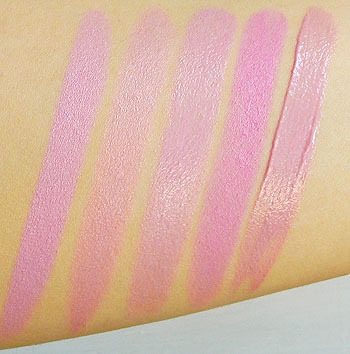 Because it’s very light (pastel), and it’s a very opaque formula of lipstick, it can look a bit harsh as it can completely block out the color of your lips (much like any pastel – such as MAC Fleshpot or Myth), but when applied sheer, and combined with a pink lip gloss on top, it’s so much more wearable. MAC Saint Germain on my lips. NYX Sand Pink Lip Liner, MAC Saint Germain Lipstick and MAC Like Venus Dazzleglass. The above photo isn’t exactly the most flattering photo of my lips – MAC Dazzleglasses are quite thick and tacky, and combined with the dryness of my lips, the colors didn’t mix properly. But, hopefully you get the idea of how the color can be easily changed to adapt better to your skin tone. I typically like applying a pink lip liner, a thin coat of Saint Germain and a pink lip gloss over top. Sometimes I’ll mix a bright pink or warm pink lipstick with Saint Germain, as Saint Germain makes colors appear much more vibrant and pink. The combinations are pretty much endless, so do a little experimenting! 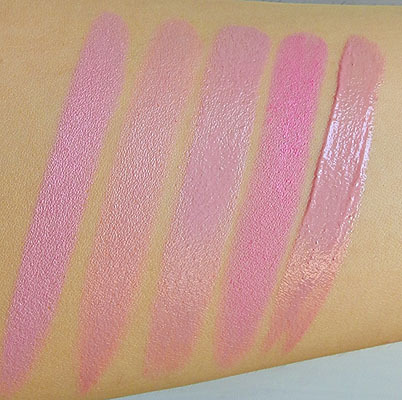 From left to right: MAC Saint Germain Lipstick, MAC Viva Glam Gaga, MAC Royal Azalea Sheen Supreme, Wet n Wild Dollhouse Pink Mega Last Matte Lipstick and MAC Enchantee Kissable Lip Colour. MAC Viva Glam Gaga is more wearable on it’s own as it’s much more sheer and slightly less blue. MAC Royal Azalea is slightly lighter and less vibrant, but is a good alternative if you want something equally opaque, with a shiny finish. If you don’t want to invest in Saint Germain, Wet n Wild Dollhouse Pink is a great alternative. It’s a bit darker and brighter, but similar enough. NYX Narcissus Round Lipstick and Revlon Pink Pout Matte Lipstick are also similar. Photo Credits: Amber Rose (Media Outrage), Lea Michele (Real Style Network), Katy Perry (Style Bistro) and Kim Kardashian (tumblr). Shabby Apple Giveaway Winner Announced! L’Oreal True Match Lumi Foundation Review! the color so gorgeous! I have this lipstick and it's one of my favorites. I apply it with a lip brush in order for the color to be a bit soft and less harsh then I use a pretty pink lipgloss over it as you said above. I agree with you, it looks much more wearable with gloss. I prefer your version with the liner and lip glass, makes it much warmer and compatible with your akin tone. yes whitening teeth would be a good idea with pastel pinky shades. I have wanted this lipstick for a while now, the colour is gorgeous! How do you get your lips to look so soft? Amazing colour! – I have a YSL Volupte in a similar shade, but this is TDF! Benefit Cosmetics Giveaway & Exclusive Benefit Tropicoral Post! This color looks so gorgeous on your lips! And thanks for sharing the great quality swatches! I always love your reviews and your choices of make-up to purchase. You're one of the bloggers who inspired me to review some of the items I fancy, too 🙂 Keep up with the reviews because we girls learn alot from you! I definitely can't pull off this shade, or shades like Viva Glam Gaga. But I love them on other people. I love the shade more when you layers it. So cute. I like this review. The lipstick color is very fine. What lip liner wud u put with this shade?